The Sports Medicine Patient Advisor contains easy to copy patient education handouts. This is the book that needs to be on every health care provider’s bookshelf and should be used constantly. Pre-print the topics that are common to your practice and have them readily available to give to your patients. Review the handouts with your patients and be sure they understand how to do the rehab. Your patients will really appreciate learning about their sports injuries or problems and will love getting a home rehabilitation program and a plan that tells them when they can return to their sport or activity. This is the resource that will improve patient satisfaction, compliance, and return to action! No patient with a sports related problem should leave your office without receiving a handout. The Sports Medicine Patient Advisor was designed to give health professionals a resource to make handouts to give to their patients. It soon became popular with coaches, athletes and parents. This edition contains a special introductory section for these readers. In this sports medicine book, coaches, athletes and parents can learn about common sports injuries and how to safely return to participation. a bilingual children's book that promotes healthy lifestyle habits for children. Dr. Pierre Rouzier is a family physician who practices sports medicine. 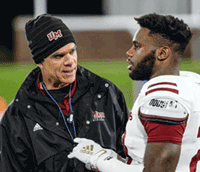 He is the team physician at the University of Massachusetts at Amherst and assistant professor of Family and Community Medicine at the University of Massachusetts School of Medicine. Dr. Rouzier attended the University of Southern California School of Medicine and the University of Massachusetts Family Practice Residency. He has a certificate of added qualification in Sports Medicine. Dr. Rouzier has been a featured speaker for numerous organizations such as The American College of Sports Medicine, The American College Health Organization, Nurse Practioner Associates for Continuing Education and numerous medical schools and training programs. Dr. Rouzier has worked in the Indian Health Service on the White Mountain Apache Reservation in Arizona and has been the assistant director at the St. Mary's Family Practice Residency in Grand Junction, Colorado.